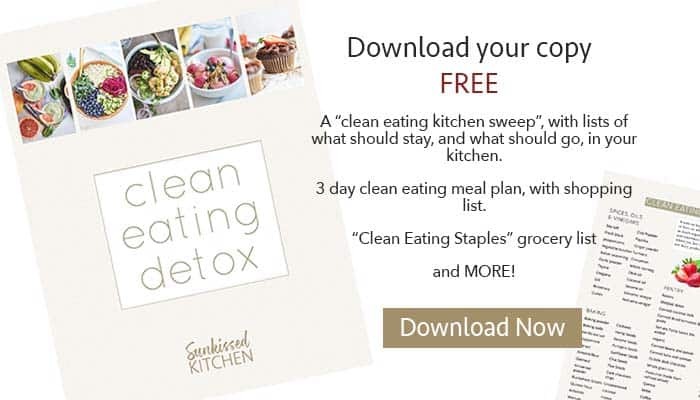 This guide to Clean Eating Sweetener Options will help demystify healthier baking and dessert making. There are plenty of options to choose from, and some work better in some types of recipes than others. I love sweet treats, and a Clean Eating Lifestyle hasn’t stopped that. I am all for eating for health, but you can’t eliminate all the foods you enjoy and stick to any sort of dietary lifestyle. Food is more than just sustenance — and anyone who claims otherwise is living under a rock. Think about family traditions, holidays, your favorite memories as a child. So many of those are circled around food. There are ways to make your favorite sweets and desserts using healthier ingredients (and using less sugar in general). My dessert archives are proof! My healthy, lightly sweetened (or no sugar added) sweets and treats are the most popular recipes on my blog. Apparently, Chocolate Chip Mint is more exciting than 3-Bean Salads! (I think so, too). Here are my favorite natural sweeteners, why they are a better option than table sugar, and how to use them! I use fruit to sweeten the treats we have here at home the most often. Bananas, dates, mango, raisins and figs are all great sources of sugar, but they also come with the added bonus of fiber and loads of nutrients as well. I use dates often. I love the caramelly sweetness, and they are just so versatile (and very sweet!). I use them for my ever-popular Oatmeal Walnut Date Bars (so so good), and I also puree them and use them in muffins and cakes. Dates are high in sugar (66%), but that’s what makes them a great substitute for the processed stuff. In addition to all that sweetness, you’re also getting a boost of calcium, iron, vitamin K and B vitamins. Bananas are also a really popular choice over here. We love them frozen — and most often, I just chop the frozen bananas and use them to sweeten plain yogurt (makes it ice-cream like! ), but we also process the frozen bananas into “nice cream,” a soft-serve consistency treat. There’s all sorts of variations to this- right now we are loving bananas, mango, and dragon fruit together (see below). We also use bananas in baked goods. Mashing bananas into quick breads and muffins allows for less added sweetener, and you can even make cookies using no sugar at all, relying on the sweetness of the fruit. Dates are a really popular sweetener for nut milks and coffee drinks. I use a blended date to sweeten my Caramel Mocha Iced Coffee Concentrate, my Coconut Mint Iced Mocha, and my dairy-free, sugar-free Vanilla Almond Latte. The only problem? Adding a date to your nut milks (or your coffee drinks) really clogs up the nut milk bag/strainer, and it does take time and gets a bit messy. I do it anyway. Anyone who makes their own yogurt isn’t going to be scared away by a little date puree. Date syrup doesn’t have all the health-boosting fiber in the whole fruit, but it does benefit from being similarly nutrient-dense. Date syrup is a great sub for honey or maple syrup in baked goods, especially if you like less-sweet options, since it’s not quite as sweet as either. Honey is another sweetener I love to use because it’s super easy, and super sweet (sweeter than white sugar!). Honestly, a 1/4 cup of honey goes a long way in baked goods. I can’t fathom making treats that call for 1 + cups of sugar anymore! I don’t know how I ever made those traditionally sweetened baked goods – once you try some of my low sugar recipes, you’ll probably agree. The calories and sugar content of honey is similar to table sugar– so why bother use this option? Honey is a natural antiseptic, meaning it has anti-bacterial, anti-viral, and anti-fungal properties. In short, it will help keep you healthier. It also has a higher nutrient content than plain sugar – so while it’s far from being a superfood, you do benefit from trace amounts of calcium, iron, potassium, B vitamins, and more. Plus, honey (55) has a lower glycemic index than sugar (68), meaning the sugar is more slowly released into your blood stream, helping to reduce sugar crashes or large fluctuations in your blood sugar level. I’ve completely fallen in love with coconut sugar. It has such a wonderfully warm and toasty flavor, so it lends a caramelly flavor to your baked goods as well as adding sweetness. Perfect for streusel toppings! The biggest reason for making the switch to coconut sugar is the crazy low glycemic index- 35! (Remember honey is 55 and white sugar is 68). It’s the perfect sweetener to use if you’re baking for kids – they’ll love it, and no sugar crashes! Making coconut sugar is a natural process, requiring no chemicals or processes that might degrade its nutrients. Sap is collected from coconut palm flowers, and then the sap is heated until the water has evaporated. Sugar cane is known to be grown using lots of pesticides and chemicals, and to make it worse, in processing sugar, the nutrients are stripped, and the remaining sugar crystals are purified to a glittering white using chemicals. I’ll take my sugar with the associated nutrients in tact, please. Blackstrap molasses is a rich tasting, super dense syrup. It’s the biproduct of making white cane sugar. When cane sugar is processed, molasses, the thick dark syrup, which contains most of the nutrients, is separated, allowing sugar to be bright white. So while molasses is still a product of cane sugar, it’s the best part! It has all the flavor, plus B6, maganese, magnesium, iron, potassium, and selenium. It’s glycemic index is 55, the same as honey. Molasses is what gives gingerbread its rich, dark flavor, and I use it in similar recipes. Another Clean Eating Sweetener Option is Maple Syrup. It often can be substituted for honey in recipes, and is a great alternative if you are vegan or prefer vegan ingredients. Another commonly used sweetener is brown rice syrup. This is helpful if you’re making something that needs extra “sticking” power, like bars or granola. I use this occasionally, but really prefer honey. Honey is much sweeter than brown rice syrup, but equal in calories per tablespoon, so most of the time, I just stick with honey. Often, healthier recipes are sweetened with non-caloric sweeteners, which I was drawn to when I first began this clean eating journey. Stevia is popular, and I believe it’s mostly safe, however, I am intolerant to it (it makes me really,really sick). Otherwise, I would probably use it occasionally. It is very, very sweet, so some manufacturers are making it in a handy dropper bottle, and adding flavors to distract from the sometimes bitter taste. Another one rising in popularity is Monk Fruit Sweetener. It is made from the monk fruit, commonly grown in SE Asia. It’s also much, much sweeter than sugar, but has a slight bitter aftertaste. I have used this, and like it if it’s mixed half/half with a “real” sugar, like coconut sugar. I haven’t explored baking with it because I just prefer to stick to the real stuff! The ones to stay away from are the ones made in a lab (chemical sweeteners). These are acesulfame potassium, aspartame, neotame, saccharin, sucralose, xylitol and sorbitol. Their brands names are Equal, NutraSweet, NatraTaste Blue, Splenda, ACE K, Sunette, Equal Spoonful, Sweet One, Sweet ‘n Safe, Sweet ‘n Low, and Sweet Twin). You can read more about these chemical sweeteners and why you should avoid them in my article, Food Additives to Avoid + A Clean Eating Kitchen Sweep. Important information, and I totally agree with you about the artificial sweeteners - they are dreadful! My mother is always pushing blackstrap molasses on me as its high in iron. Love this! I always add bananas to my french toast and pancake batters to make it naturally sweet so we use less or no maple syrup. Also a big fan of dates and dates sugar! Such a great guide! Dates are a new favorite of mine. Definitely a great way to continue to enjoy sweets while getting some nutrition too. I agree Tara! I hated the look of dates for so long, and once I tried them, I was hooked! I use all the sweeteners you mentioned! Great list! Great tips on how to sweeten food without sugar! I usually use honey but will try some of the other options that you mentioned. Honey is certainly my go-to-- but lately I've been using whole dates more and more, and have found that I actually prefer the lightness of date syrup to honey a lot of the time. Always naturally sweet (fruit) or pure stevia for me! What a fantastic resource, I know sooo many people who get a lot of use out of this! edit: so many people who *will get a lot of use out of this. ;) Oi.